Caulking is a type of sealant that forms a tight bond between two materials. Tar and mortar are some of the oldest types of sealants, although these are not suitable for many of today's materials, including copper. Like other slick metal surfaces, copper requires a special type of caulking that helps prevent water and air from entering the environment between the copper and adjoining substrates. Not all caulking adheres to copper. Silicone is the type of caulking that seals metal surfaces, such as copper. Silicone caulking comes in a variety of strengths. 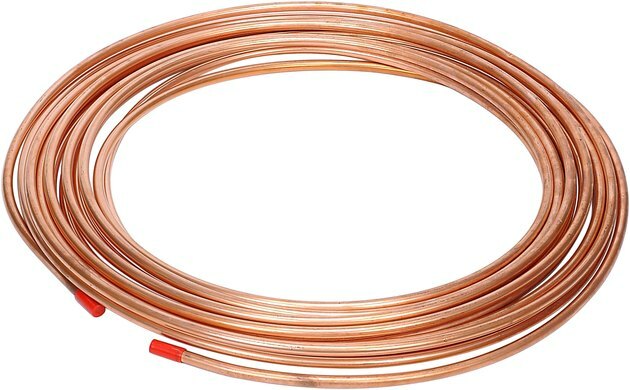 One hundred percent silicone caulking works well for most applications involving copper, including those that sustain high heat, such as flashing around chimney outlets. In addition to various strengths of silicone caulking, you may see siliconized caulking products. Although these work on most metal surfaces, always read the labels on these products to determine the intended uses for each. Silicone caulking compound labeled for household use is suitable for most indoor repairs that involve copper plumbing and metal fixtures. Household caulking made from silicone works well to seal joints between tubs and faucets, as well as around outdoor gutters. Silicone caulking also comes in construction strength. This compound provides good to excellent strength in creating a tight bond between metal and other surfaces, such as copper flashing and nearby stone, wood or brick. It seals these dissimilar materials together while experiencing very little shrinkage, making it suitable for use over joints and abutted areas. Although you can use silicone construction caulking over copper and painted surfaces, fresh paint won't adhere well over the top of this type of caulking. Butyl rubber is another type of caulking that works with metal, such as copper, although it tends to shrink more than silicone caulking. Butyl rubber caulking helps to seal together dissimilar materials, such as copper and plastic, or copper and glass. Unlike silicone caulking, butyl rubber caulking accepts paint, although you need to wait about a week for the caulk to cure before painting. This type of caulking does not adhere to previously painted surfaces.